Ergonomic Safety Handle - Makes standing and sitting easy and safe. 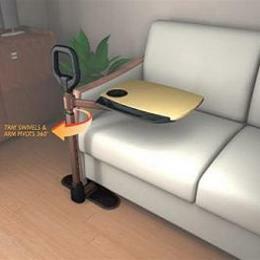 Swivel Tray - Use Laptop / TV tray with cup holders and utensil compartment. Adaptable - Adjusts in length and height to fit either side of your favorite couch or chair. Super Grip Rubber Pads - Ensure stability and protect floor from damage.